What are the advantages for vendors (brands) and retailers? Retailers can access standardized vendor catalogs at locally.com free of charge. Using Locally.com's standardized catalogs greatly simplifies the challenges that occur from using wildly different formats from different vendors. Retailers with POS systems that allow importing product data can drastically reduce data entry time and errors associated with human data entry. Capture of UPC info from catalog import eliminates the effort to capture UPC info during order receiving and reduces receiving errors. Even manual data entry is easier when viewing standardized catalog data. Using Locally.com standards helps vendors deliver exactly the right data to Locally.com and helps support retailers and local retail sales. Locally.com uses the standard to minimize costs of its services to vendors. The full specification for the "Product Data Catalog (Part 1)" standards is available here (our presentation cover letter is here). 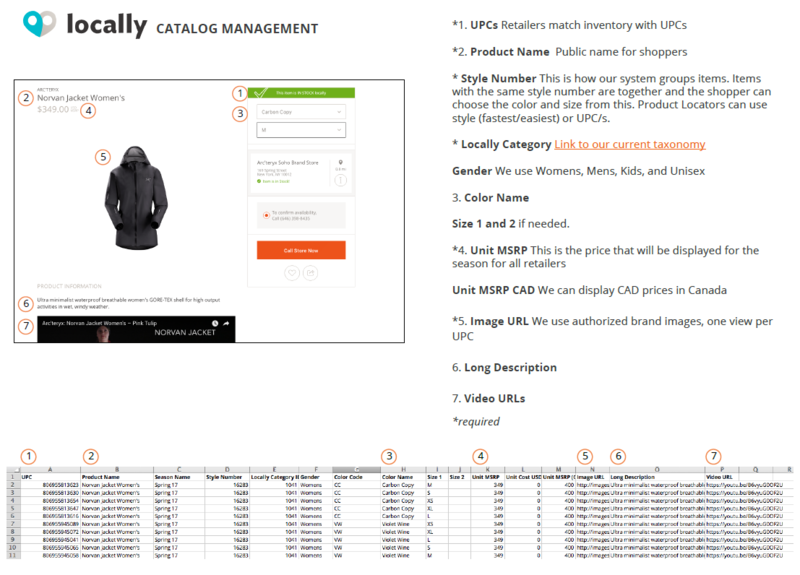 Locally.com's "Product Data Catalog (Part 1)" specifies a standard file format for vendors to communicate product data to locally.com and participating retailers. The standard is lightly modified from a previous Outdoor Industry Association B2B Working Group standard. Part 1 covered here supports product data creation. Part 2 is coming soon and provides a standard to provide descriptions, style and sku images, and other extended product data used for marketing and web content. Vendor product catalog files that meet the standard include 18 columns of required and optional information in the specified order. As you can see from the sample data, this is straight forward and easily understood. Who is using the standard? A growing number of small and large retailers use the Locally.com standard. At one time or another approximately 150 OIA and SIA vendors have generated catalog information partially or fully complying with this standard. And of course Locally.com uses this standard to help vendors and retailers connect to sell products locally.